BUDGET. The first thing you need to decide is how much you can afford to spend on your mobility chair. The price range for powered chairs is huge – anywhere between €500 and €5000 or more. You can buy New or Reconditioned from Electric Mobility and both come with a 12 month warranty. WEIGHT. The next most important decision is the carrying capacity required. Maximum carrying capacity can vary from 15 stone up to 35 stone. It would be advisable to go for a vehicle for can carry well in excess of your weight. PURPOSE. 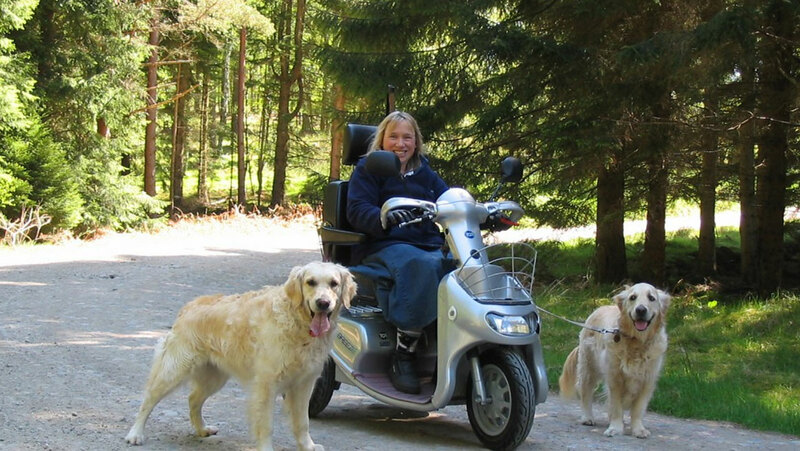 Ask yourself what you want to be able to do with your powered chair. Do you need to use it every time you leave your home or just on the longer outings? Do you just want to drive around in the shopping centre or supermarket, or do you want to be able to tackle sidewalks, outdoor recreational areas and anywhere else that takes your fancy. PORTABILITY. Do you need a scooter that is designed to be portable as well, one that can be easily broken down into a few components that will fit inside the boot of your car, and even be transported as luggage on planes, trains and bus. All powered chairs come with dry cell batteries which allow them to be transported on buses, trains or planes. You need to contact whomever you are travelling with to ask them if they have size or weight restrictions. CRUISING RANGE. Is the distance that you can go on one charge important to you or do you just need something for very local errands? Some powered chairs can only do 6 or 7 miles on a single charge, whilst others can do 20 or 30 miles. You also need to consider are there steep inclines where you wish to travel and ask what is the maximum incline the powered chair you’re buying capable of. TURNING RADIUS. Is the turning radius of the powered chair an important factor for you. For electric wheelchairs it is usually excellant. However for Mobility Scooters turning radius varies significantly, and can be anywhere from 32″ to 64″ on most powered scooters. So think about where you want to use your scooter – supermarket aisles tend to be quite wide, but the corner store is not. Some restaurants and shops can be quite tight too. A three wheel mobility scooter has more manoeuvrability than a four wheel. STORAGE. How much stuff do you need to carry around with you on your scooter? They all have a basket that can accommodate a few items, some have storage under the seat. Bear in mind that you can purchase additional storage baskets that attach to the seat back or various nylon bags that attach either to the seat back or armrest. And if you need to travel with oxygen, you can get a basket or bag for that too. WHEELS. Powered mobility chairs come with either solid or pneumatic wheels. So you do need to think about the practicality of repairing flat tires and punctures if you are leaning towards pneumatic tires. Punctures are rare, but they can happen. If you choose solid tyres you eliminate the possiblility of punctures but you can have a harder less comfortable ride.